The Frontier Extension District is a branch of K-State Research and Extension. Extension programs present educational information related to agriculture and natural resources, family and consumer sciences, 4-H youth development, and community development. We serve the people of Anderson, Franklin, and Osage Counties, and we have offices located in Garnett, Ottawa, and Lyndon. Congratulations to Gary and Delores Rieck, Frontier Extension District, who have recently been named to the 2018 Class of Kansas Master Farmers and Master Farm Homemakers! The Kansas Master Farmers and Master Farm Homemakers program recognizes Kansans for success in their agricultural operations and service to their communities. Gary Rieck graduated from Burlingame High School and continued his education in animal husbandry at Kansas State University. He then worked as a hog buyer for Swift and Company in Kansas City. After a year in Kansas City, he returned home to farm with his father. Gary’s passion for farming led him to hold several leadership positions. He served as president of the Kansas Swine Seminar and Kansas Young Farmers. Both Gary and his wife, Delores, are contributing members of area farming groups. Both have been members of the Southeast Farm Management Association for 54 years. Gary has also been a county director for that organization. Delores served as president of the Kansas Young Farm Wives Association. Delores graduated from Emporia State University with a bachelor’s degree in business education. She furthered her education by earning a master’s degree. Delores taught at Burlingame High School and Osage City Middle School. After retiring, she continues to educate students by teaching quilting classes. Delores has presented quilting programs across Kansas and started a business for her hobby. The Riecks’ farming operation started out with 25 gilts in a farrowing-to-finish system. Today, the Riecks have transitioned to feeding cattle and farming soybeans and grass hay. They also have acreage dedicated to the Conservation Reserve Program. The Goodyear Soil Conservation Award was given to the operation for their management practices. K-State Research and Extension programs, co-op crop seminars and crop expositions to help the Riecks constantly learn about practices that could improve their farm. Son George works on statistical analysis for GPS crop mapping. He lives in Des Moines, Iowa, with his wife, April, and two children, Holt and Cabe. Daughter Gwen Hoy and her husband, Josh, operate an agri-tourism program in the Flint Hills. They have a daughter named Josie. Rotation grazing is recognized as a way to utilize pastures and forages more efficiently. Join us for a hands-on Management Intensive Grazing school for producers. A collaboration of experts from K-State Research & Extension, Natural Resource Conservation Service and the University of Missouri are joining together to offer a two-day event. The Grazing School is designed for adult learners and is limited to a maximum of 35 farms. Registration is $60 for the first person from the farm or ranch, additional persons from the same farm is $30 each. Registration includes snacks, lunch both days and proceedings. Registration is on a first come, first serve basis. 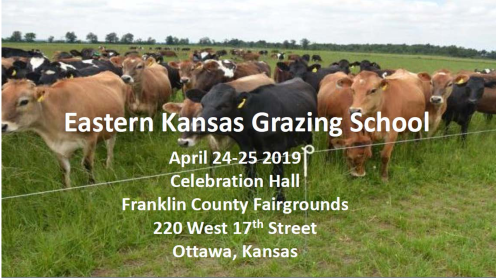 For more information, check out the Livestock page or contact Rod Schaub at 785-828-4438 or rschaub@ksu.edu. Check out the Calendar of Events to find out more information.